Summer has definitely peaked in NYC and the humidity is off the hook. Keeping my face clean-shaven and my hair shaved/buzzed leaves way too much skin exposed on the top of my head, a place that easily becomes oily and starts looking like a chemical weapon. Yikes!! To help foil the oil, I’ve added a few additions to my “summer skin arsenal.” I’ll write about each one in an individual post but I wanted to let you in on my numero uno skin saver of the day — Jack Black All Day Oil-Control Lotion. 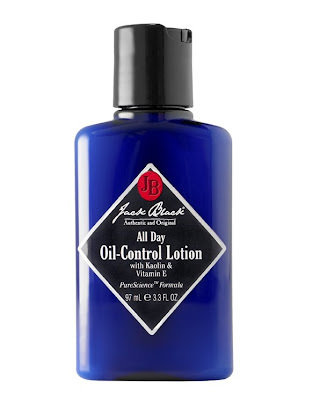 Jack Black All Day Oil-Control Lotion instantly soaks up excess facial oil, then controls it by reducing sebum production under the skin's surface. Natural oil absorbing ingredients, such as cotton and China Clay give the skin a matte finish that is smooth, soft and shine-free. All day shine control without drying out the skin. Love it! Jack Black All day Oil-Control Lotion is available at Neiman Marcus, Nordstrom, Bloomingdales, Sephora, Saks Fifth Avanue and at www.getjackblack.com.